Apply enough effort and you can, according to countless toe-curlingly cheesy web memes, achieve anything. So it is with these two; performance cars as far removed from the ‘just add lightness’ ideal of a Lotus as can be. Were you to choose your ideal foundation for a ground-based missile able to lay waste to both endless straights and tricky curves with equal ease, you wouldn’t start with a four-door monster of a ’shell weighing two tonnes. Not unless you had a sense of humour. 50th this year it’s unleashed the E63 S, Merc’s slick and unfeasibly handsome E-Class saloon corrupted absolutely by a barely downsized twin-turbo V8. It’s also four-wheel-drive as standard, though you can turn it off if the idea of driven front wheels offends you. Read CAR's original AMG E63 S review here. High on an apparently deserted hillside on the Scottish border, a place of spine-jarring cattle grids, big skies and terrifyingly fast logging trucks, I blat away from a standing start in the E63 S (the 41bhp less-powerful non-S E63 is £9360 more affordable) for the tenth time. The road runs uphill and yet the colossal V8 needs fourth gear within 100 yards, the ferocious, unending acceleration as laugh-out-loud impressive this time as it was the first. 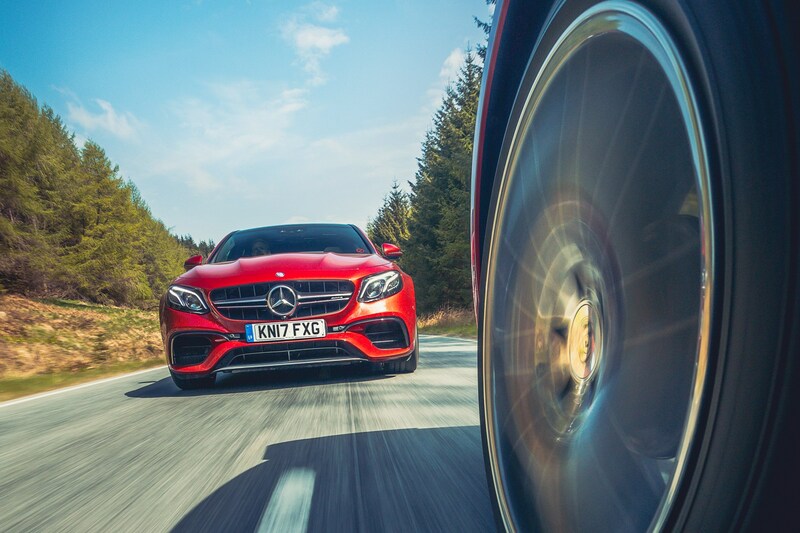 Leaning hard on the brakes before the first left-hander, the AMG squirrels a little as the awkward bumps try to catch it out, but it settles, and with the wheel swivelled a quarter turn it’s time to feed the power back in. Four-wheel drive is still engaged – we’re still getting to know each other, the E63 and I – but ESP is off; how much boot to use? A determined prod past the halfway point and the response from the powertrain is instant and emphatic. The AMG squats and writhes a little at the rear but, with a subtle straightening of the wheel, just grips and fires out and up the next climb with undimmed ferocity. Fun, no doubt, but controlled too, the car well within its limits. Must try harder. Yesterday the AMG E63 S met the Porsche Panamera Turbo for the first time (your lesser option is the 4S; down 102bhp for £90,291). Testament to fast family-car overkill, meet testament to fast family-car overkill. Finished in Design Hyacinth metallic paint, which is less like a ’90s BBC sitcom than it sounds, the Merc looks tightly stretched over its 20-inch wheels, its lines low-key aggressive. As with the previous E63, choose dark paint and wheels and you can go almost unnoticed. Finger the E63’s starter button and there’s a brief flare of revs before it settles to a surprisingly quiet, even idle. You can have pretty raucous straight from the off if you switch the Dynamic Select mode into one of the more aggressive options, but leave everything alone and the car defaults to softly spoken Comfort. 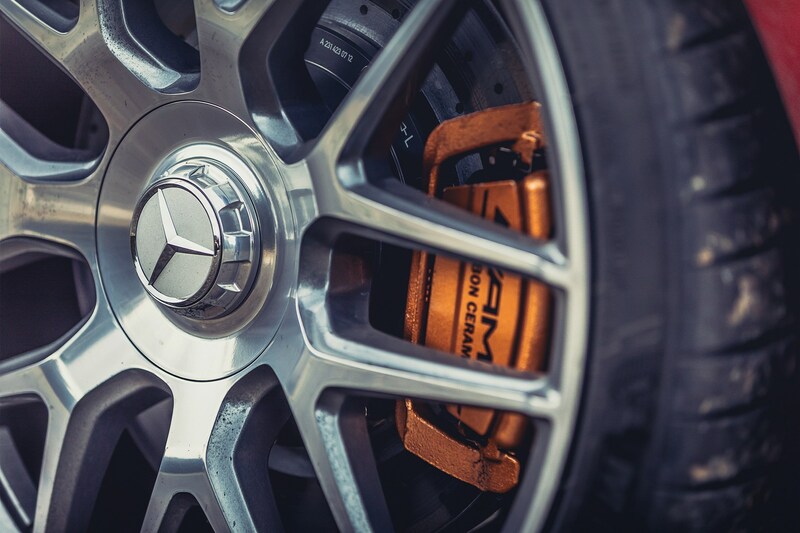 That means the AMG-specific air suspension in its softest setting, although for the first 10 minutes you’ll find yourself checking that the Dynamic Select really is in the right place. There’s no other way to put this; even in Comfort, the E63 S is firm. At lower speeds on urban roads it gives a little, but not much, over lumps and imperfections, keenly following the contours of the surface. You could never call it harsh, but even for a super saloon wound all the way down it’s surprisingly stiff. frustrated, there’s a perverse satisfaction to be had from having all that performance onboard but tapping into so little of it to run with the pack. But restraint is required. The E63 S gathers speed with an ease quite unlike anything else I’ve driven. Time to swap into the Porsche, before I get carried away. While it’s still unlikely to be mistaken for anything else, the second-generation Panamera is light years ahead of the original on aesthetic appeal. Beauty still eludes the big Porsche but it’s now truly striking, rather than striking as a polite word for ugly. Where the old car looked like a failed attempt at crossbreeding a 911 with a sedan chair, Panamera 2 is slimmer around the nose and waist, has a more natural look to its 911-echoing curves and is in possession of a far tidier rear. This, you soon realise, is how the Panamera was always meant to look. In the Porsche the contrast with the E-Class’s cabin is striking; you sit significantly lower in a true sports-car posture, the window line running over your right shoulder and your hips buried low in the car’s mass. It feels serious. And it feels good. less cluttered cabin, though – like Windows 10 – the home screen you’re presented with boasts a bathroom fitter’s worth of tiles on start-up. 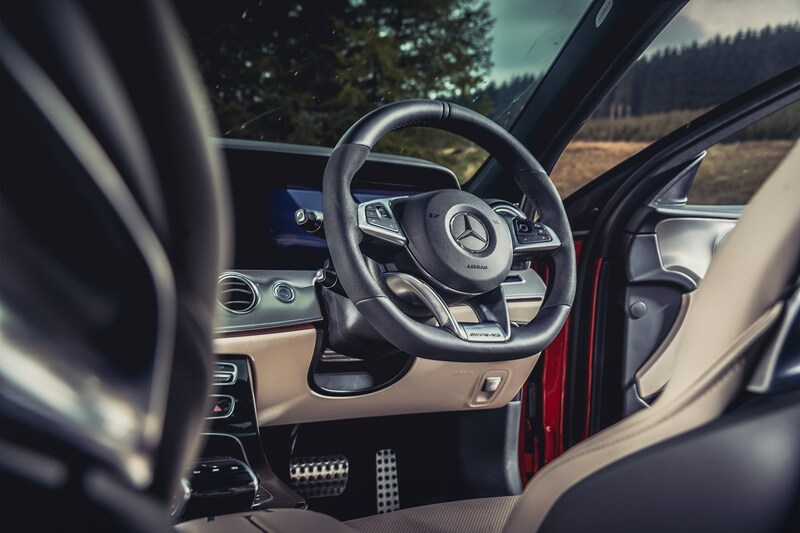 The Mercedes is a fraction more conventional, although it too goes for the fully digital display, which you operate via navigation wheels or voice control. The graphics are super-slick and the displays endlessly configurable, but the reactions of the control wheel are frustratingly sluggish. A software update might well cure it, but for now it is occasionally irksome in a cabin that otherwise beautifully blends gentle curves with sharp tech. Drive the Panamera sensibly and you’d be hard pushed to identify its motor as a V8 at all. There is a subdued multi-cylinder chorus happening somewhere – it’s unmistakable – but with the drive mode, suspension and gearbox switched to their snooziest settings it’s surprising just how much of a prod is required to wake the thing. A deliberate ploy, you suspect. 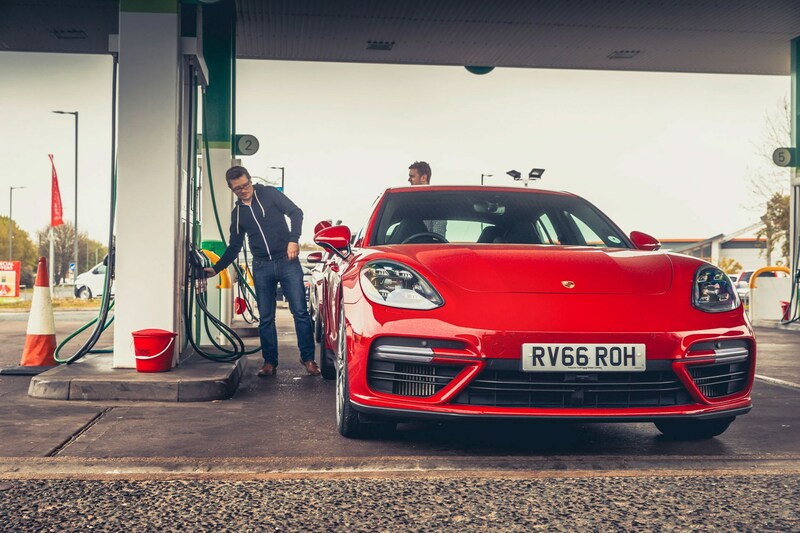 Read the original Porsche Panamera Turbo review here. After the feisty E63 S the Panamera Turbo feels muted, but it makes sense within just a few miles of lumpen A-roads – this is a supremely comfortable car. The ride, on Porsche’s take on air suspension, is superb. You can simply forget about the quality of the surface beneath the Panamera’s wheels, and when you’ve passed 100 miles before 9am that’s welcome news. It’s likely these cars will spend the majority of their time in get-you-home mode rather than Time Attack, and driven thus the Porsche – not the Mercedes – is the more sensible choice. It’s not that the E63 S is uncomfortable, but its focused ride never lets you forget you’re in a performance machine sprung to suit. By contrast the Panamera does a convincing impression of a luxury saloon – just one that’s been slammed to the deck by a reputable back-street tuner. Still in the Porsche, we move on lightly-trafficked A-roads closer to the Scottish border, and as the traffic clears the pace increases. 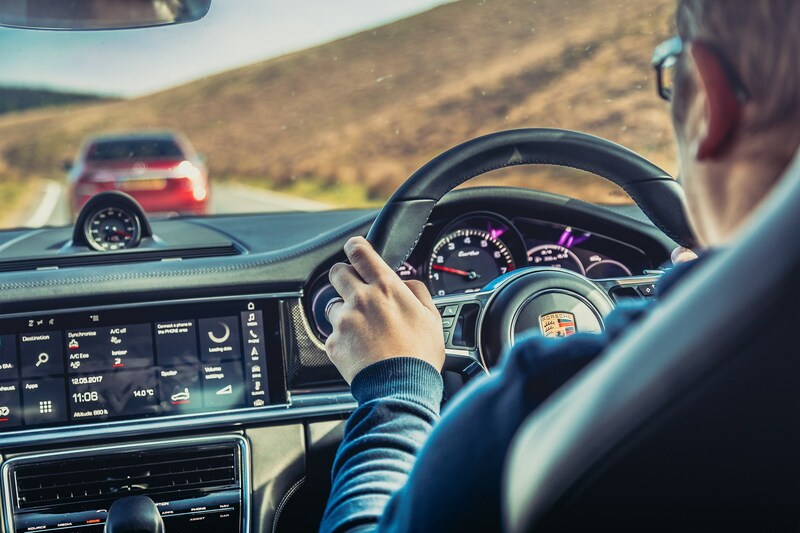 Whisking along at a comfortable but brisk speed, the Panamera delivers a wonderful sense of control and composure. 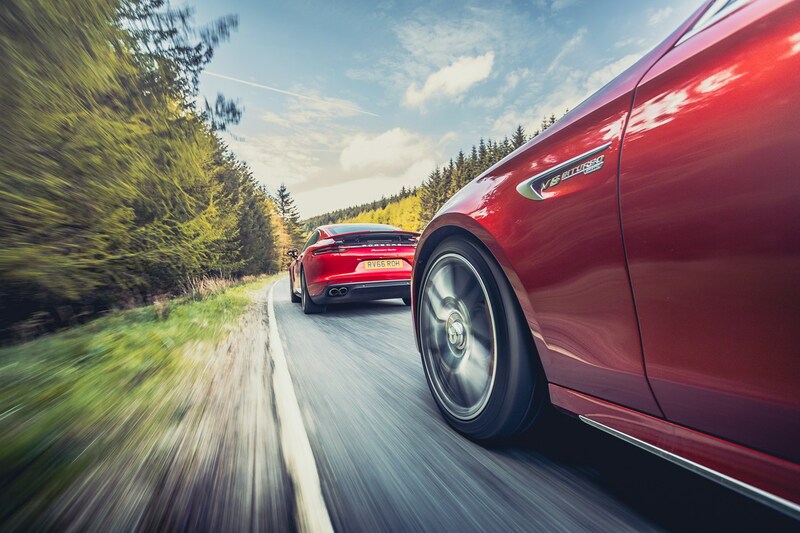 It’s no harder to drive at seven-tenths than it is at two-tenths; the Panamera glides over bumps and tracks through bends beautifully. It covers ground like a low-flying strike aircraft and feels just as invincible. You could drive like this for hours, never being troubled by the conditions and merrily dividing distance by time at a scarcely believable rate. On a journey like this, where you want to move quickly but discreetly in convoy, Porsche’s Sport Response button makes a whole load of sense. Switching between modes from the wheel is convenient, but being able to tap into 20 seconds of maximum snap and crackle is deeply satisfying. Easily dismissed as a gimmick, in truth it lets you make the most of those great stretches of clear road as and when you find them. The Porsche has no trouble keeping up with a fully extended E63 S either. 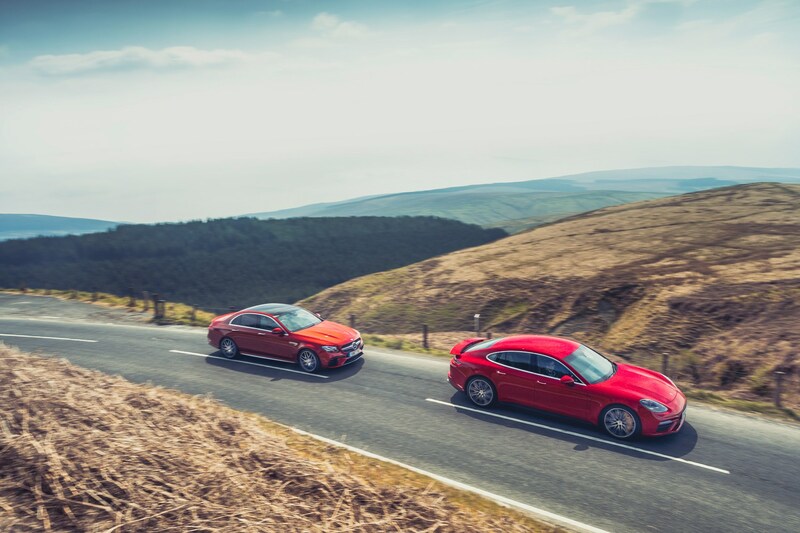 With 542bhp and 568lb ft of torque it’s hard to imagine it failing to keep up with anything, but the AMG has both a power (62bhp more) and weight (120kg less) advantage. 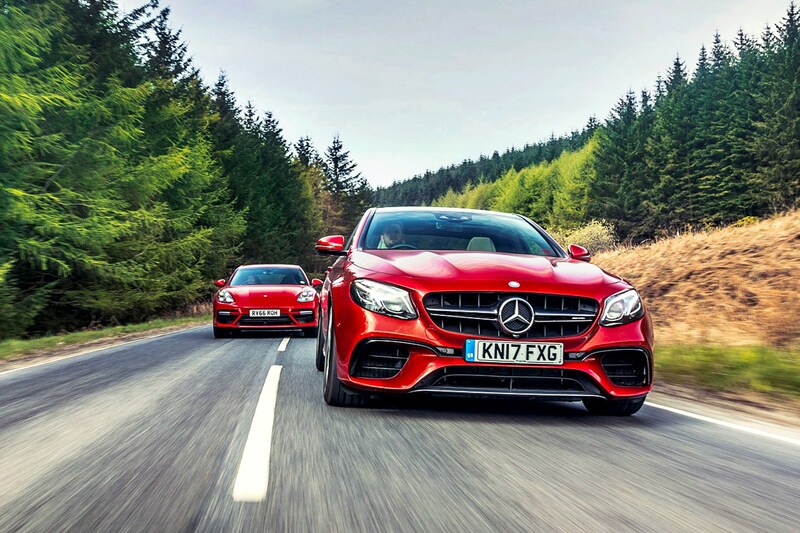 Power-to-weight is 262 versus 310bhp per tonne for the E63 S, but both cars are perilously close to two tonnes thanks to four-wheel drive, auto gearboxes, miles of electronics and several dead cows. So the Panamera is every bit as quick. Thing is, it’s the less exciting car. Get giddy and the E63 S reveals a second personality quite unlike the mild-mannered family saloon that brought you here via miles of motorway. Thumb the wheel to slide into Sport+ or Race mode and the nods to comfort are instantly dispensed with. For starters the exhaust is allowed to sing freely, the more aggressive setting bringing artillery bangs on the overrun and rock-band thunder at high revs. It’s unnecessary encouragement, frankly, because this 4.0-litre V8 with a pair of twin-scroll turbos providing a raised middle finger inside the vee is the best in the business. There probably is – there has to be – some turbo lag. But it’s either imperceptible or you’re too busy hanging on to notice. From any revs there’s both response and torque delivery to die for, yet there’s still the spirit of the old 6.2 in the glee with which the thing revs all the way out. Despite launching to 62mph in a theme-park 3.4sec, it’s at higher speeds that the AMG’s ability to pile on yet more pace with scant regard for physics that beggars belief. What of this recourse to four-wheel drive, smart gearboxes and the sanctioned hooniganism of Drift mode? Don’t think that the extra pair of driven wheels means you’ll need to be selecting Drift all the time to have any fun. With so many variables to play with, the E63 S lets you perfectly tailor the car to the conditions, the talent available and your mood. On a tight, fast and uneven Scottish B-road, Race mode with slackened ESP and the middling suspension stiffness is just about perfect. The firmness to the suspension now pays off, the car staying as flat and as controlled as you could reasonably expect, to the point where it often feels like you’re driving a Mercedes from earlier in the alphabet. And the AMG will give you oversteer even with the front wheels at work. In fact, the intermediate settings deliver when you want a degree of sideways but still need to be fast, allowing you to enjoy the balance of power and grip without worrying about things getting really out of hand. The steering, a little mute in normal driving, is more communicative at speed and with more significant inputs. In full manual mode the gearbox only occasionally denies you an early shift down. Drift mode might be something you mention rather than use on a regular basis, but you definitely should try it, if only to be amazed at how benign a 604bhp rear-drive saloon can be. You might need to read the instructions carefully to find it, but the effort required to access this bastion of hairy AMG attitude is well worth it. This is a big car, but flicking it into full oversteer is hilariously easy and satisfying. Turn in, apply large amounts of throttle and the tail swings rather than snaps out. Half a turn of the quick steering gathers it up, and then you can revel in making minor input changes to increase the drift, holding it steady or gathering it up. The E63 S helps you forget just how much it’s worth at this point on account of its biddability, which is likely no bad thing. It seems like a complete role reversal, but jumping into the Panamera immediately afterwards feels like a switch into a luxury saloon. 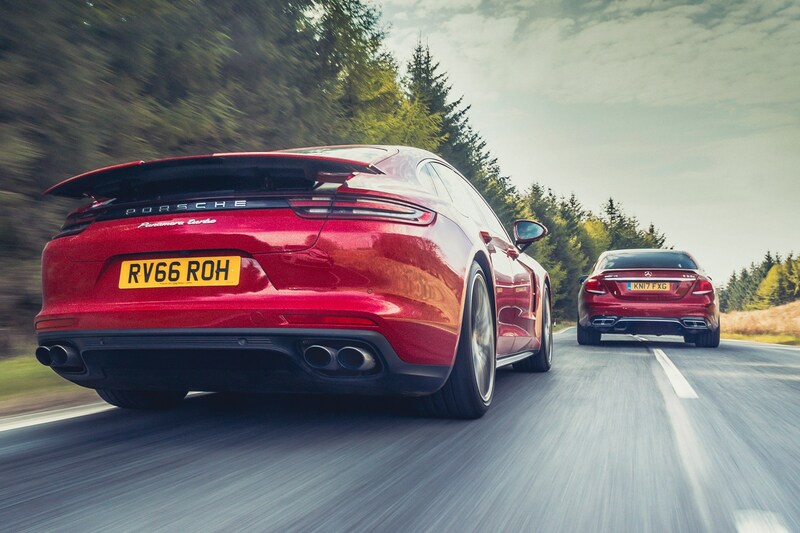 A similar sequence of button pushing to gee up the Turbo to full aggression fails to turn it into some thinly disguised track tool; the Panamera is too keen to hold onto its brief to provide fast, comfortable transport first and foremost. 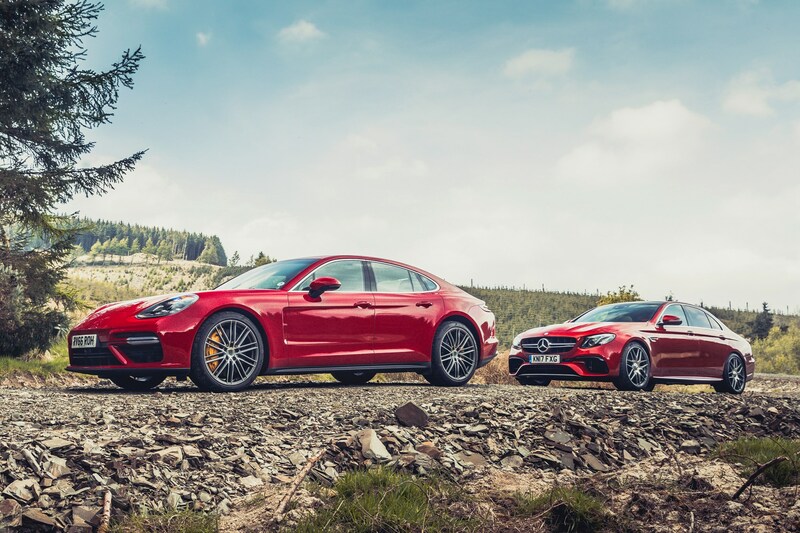 The speed is there of course, and the PDK transmission lets you make the most of every single horsepower, but the Porsche feels coldly efficient after the heart-on-sleeve AMG. Some will love it for that. The steering is accurate but not pin-sharp and feels a step behind the Mercedes. There’s also a distance between you and what’s going on down at the road. This test car is specified just as you’d want it, with rear-axle steering (£1478), physics-defying carbon brakes (£6449) and the Sport Chrono package (£1515). Press on and understeer is sternly resisted. 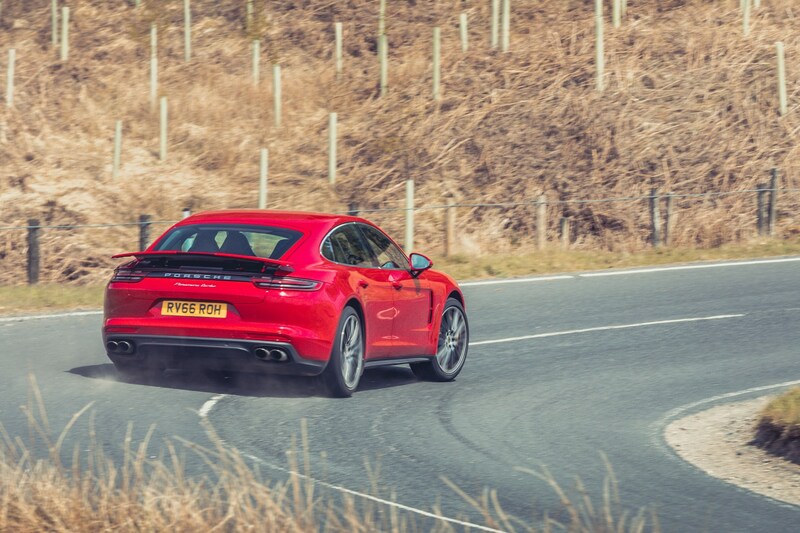 Likewise oversteer is unlikely on the road, the Panamera preferring to four-wheel drift when you cross the line. That makes it a terrific tool for tackling fast roads with complete confidence – but not necessarily huge amounts of fun. 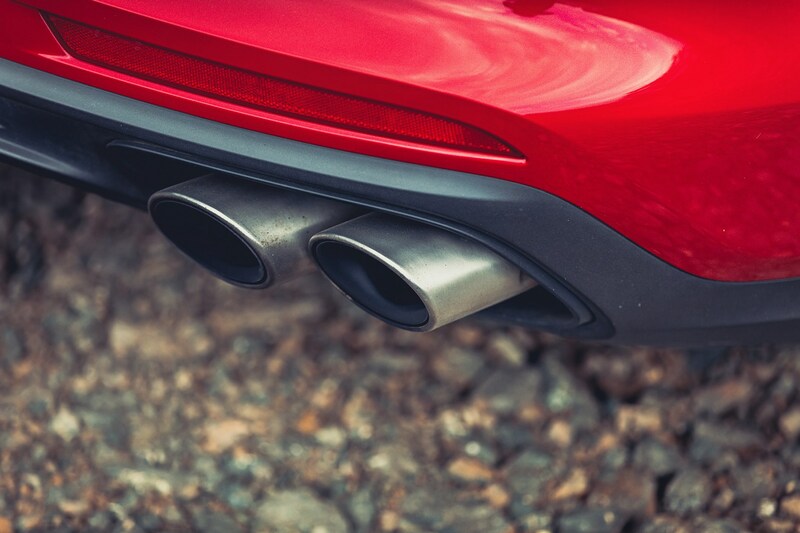 You can charge up to a bend, carrying more pace than you originally intended and, while your heart may begin to flutter, the Panamera’s mighty 10-piston front brakes always have your back, hauling the speed down to something like sensible time and again. 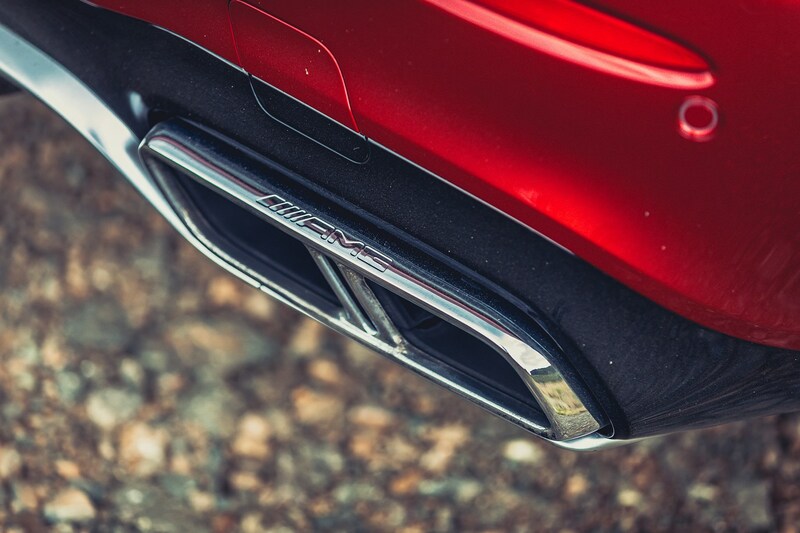 Flick the car in and it settles eventually – your cue to defy logic and slam the throttle back down. The car then just deals with it, shifting the power around and blasting you through the corner. The Porsche builds your confidence, forgives all kinds of silliness, tidies up your mistakes and sweeps you along with its reserves of ability. These cars tackle similar briefs from opposite directions. The Panamera aims to capture Porsche’s sports-car breeding in a more practical, comfortable and usable package, and unquestionably succeeds. The AMG takes the world’s favourite saloon and injects all kinds of banned substances – again, with complete success. You could buy the Porsche, swallow the considerable price difference and never question your judgement. 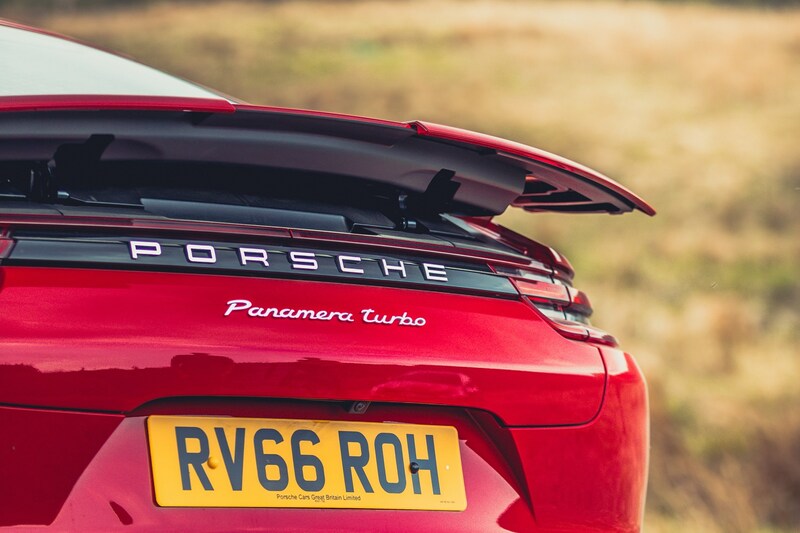 It’s sensationally capable and inordinately easy to live with given the performance available, but in making it so comfortable the spark that makes every drive in a 911 an event has been smothered, and you’ll never fail to notice the Panamera’s weight. As a ground-coverer it’s brilliant, but then so is the £20,000-cheaper Panamera Diesel S.
The E63 S is a surprise. It is the firmer, edgier drive. Its set-up has the potential to irritate, and stopping for fuel every 250 miles is never fun. But it’s the more useful car – five seats, bigger boot – as well as the more entertaining. It’s wild within well-defined parameters worked out on a giant spreadsheet in Affalterbach, and while that might sound like sanitised fun it all hangs together beautifully. For the drive home it would be the Porsche, but to take home? The AMG, without question.